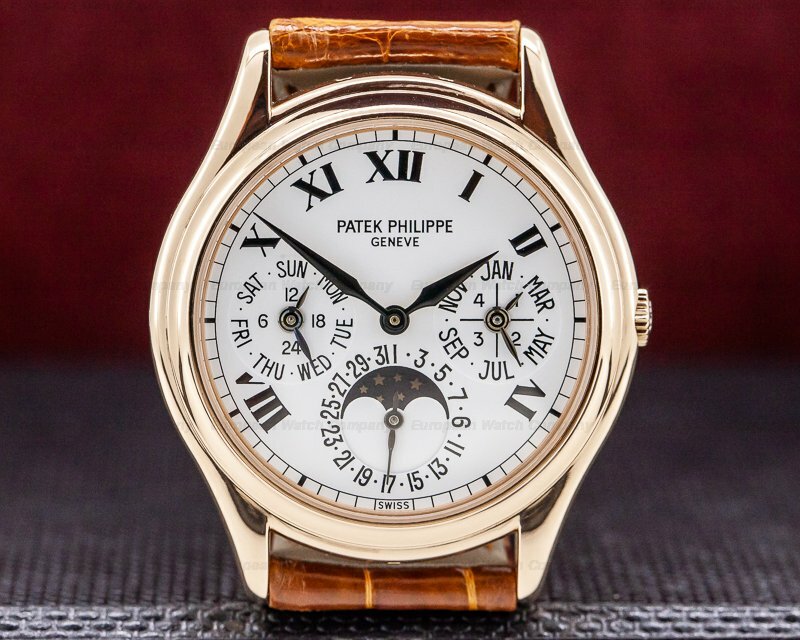 30134 Patek Philippe 5146/1R Annual Calendar, 5146/1R-001, 5146R, 5146 1R 001, 18k rose gold on an 18k rose gold bracelet with deployant buckle, automatic Patek Philippe caliber 324 S IRM QA LU movement, annual calendar, day, date, month, moonphase, power reserve indicator, centered sweep seconds hand, ivory / off white dial with applied markers and Arabic numerals, sapphire crystal, display back, water resistant to 25m, diameter: 39mm, thickness: 11.2mm, like new with box and papers dated July 2013. 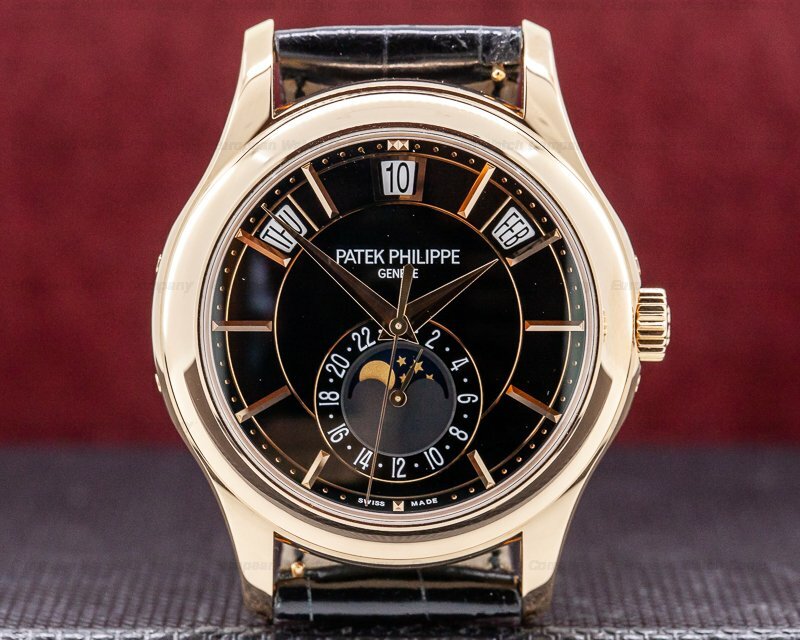 This is an 18K rose gold Patek Philippe Annual Calendar Moon Phase 5146/1R-001, It has an 18K rose gold bracelet with an 18K rose gold deployant clasp. It has a scratch resistant sapphire crystal, and a screwed-down exhibition sapphire display case back. 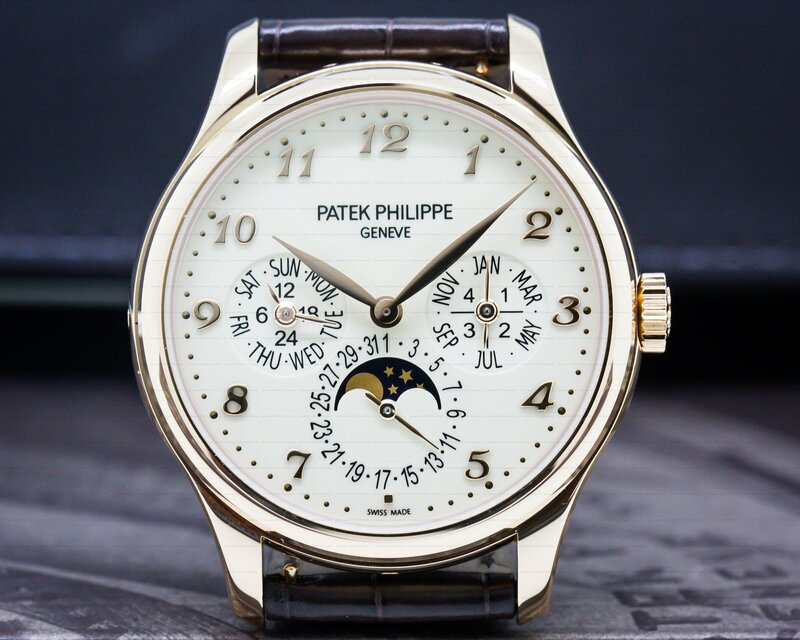 The 39mm diameter solid two-body case, rounded stepped bezel, and downturned lugs are polished. 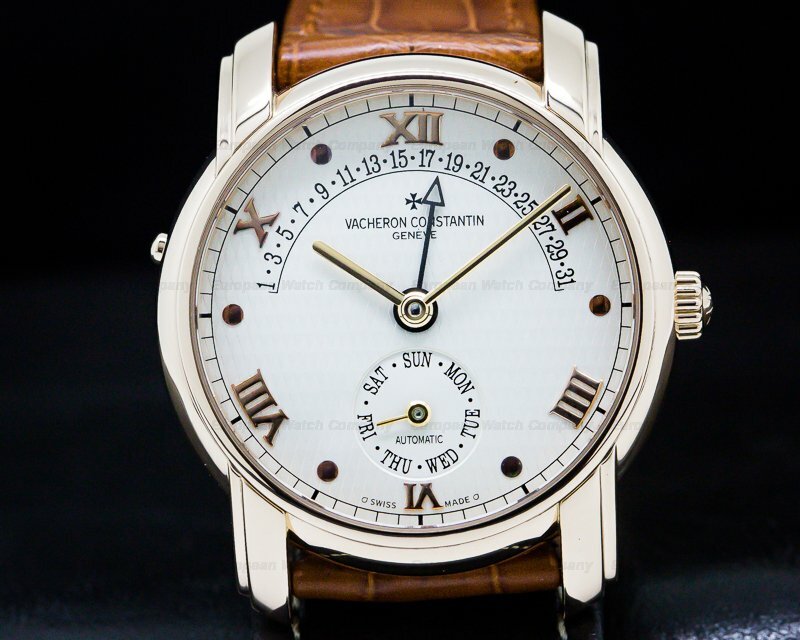 The dial is ivory / off white with applied rose gold Arabic numeral hour markers at three of the quarter hours, faceted gold baton markers at the rest, and luminous white gold feuille hands. The outside seconds/minute track has luminous dot markers every five minutes. 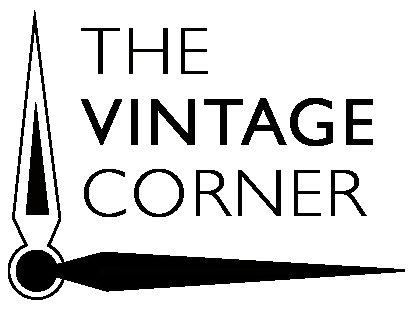 The subsidiary dial at 9 o'clock has the days of the week, while the dial at 3 o'clock shows the month; a plus/minus power reserve meter is at 12 o'clock. 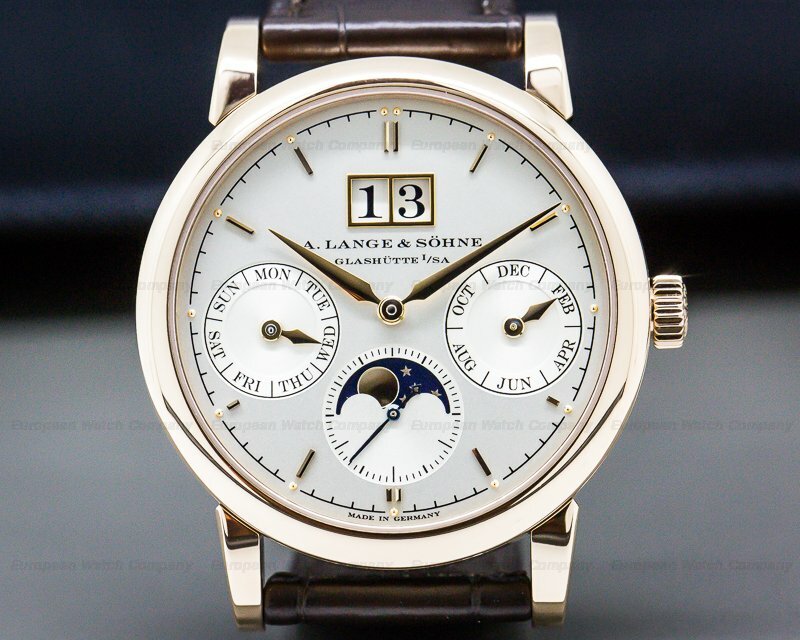 The moon phase display and the date aperture are at 6 o'clock. It has a 45-hour power reserve at full wind, and it's water resistant to 25 meters/80 feet. The 11.2mm thick case, dial, and movement are all signed. 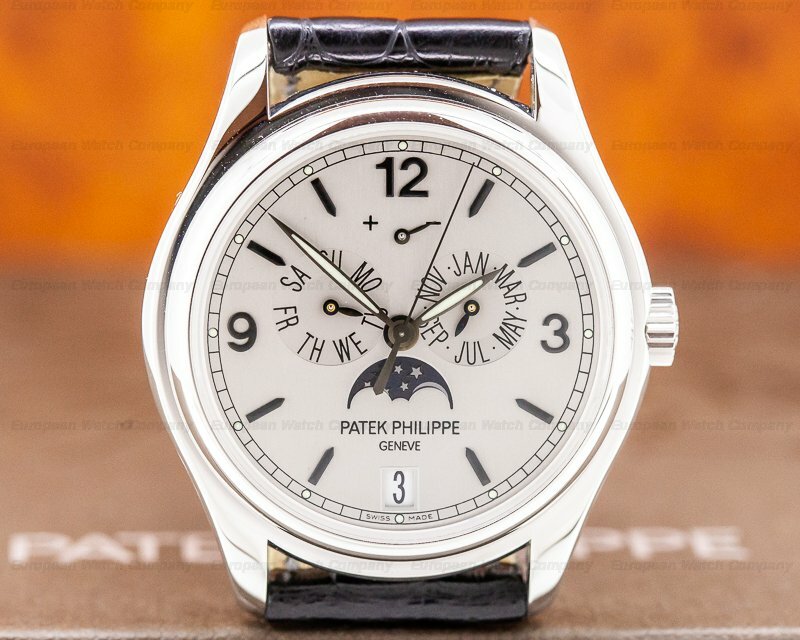 This Patek Philippe Annual Calendar Moon Phase 5146/1G-010 has a mechanical self-winding caliber 315/299 movement is stamped with the Patek Philippe seal. It's rhodium-plated with fausses cotes decoration. 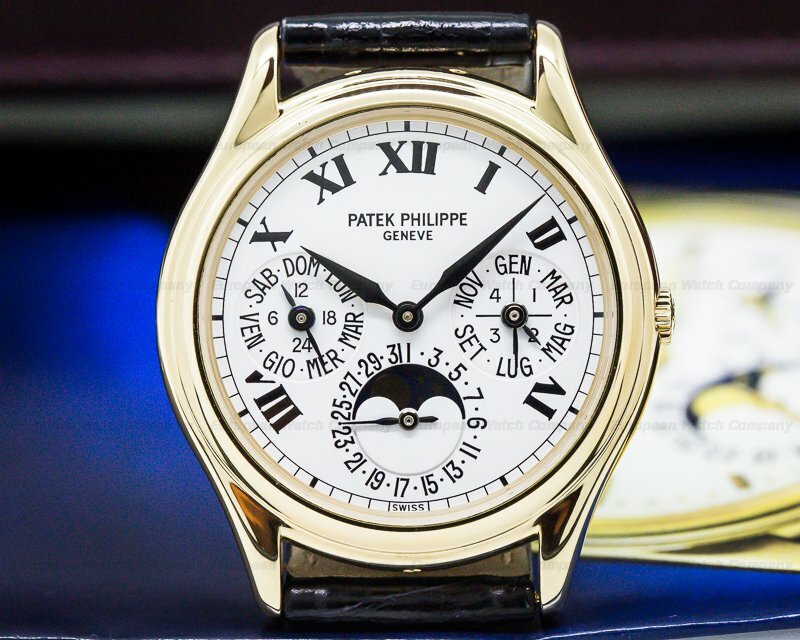 The mechanism contains 36 jewels, 355 parts, a straight-line lever escapement, and the patented Patek Gyromax balance that's adjusted to compensate for cold, heat, isochronism, and 5 positions. 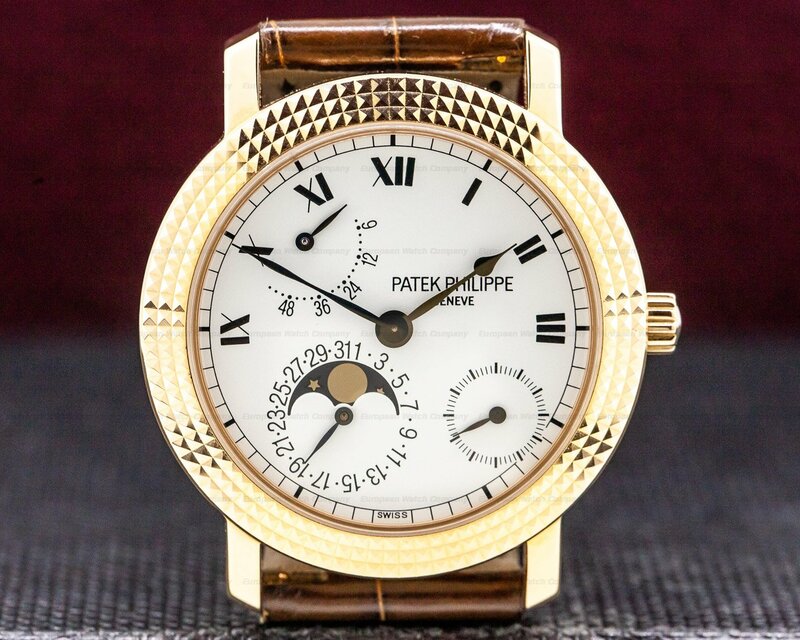 Included are a shock absorber and a self compensating free-sprung flat balance spring, and a 21K gold rotor. The movement oscillates at a frequency of 28,800 vph (4 Hz). 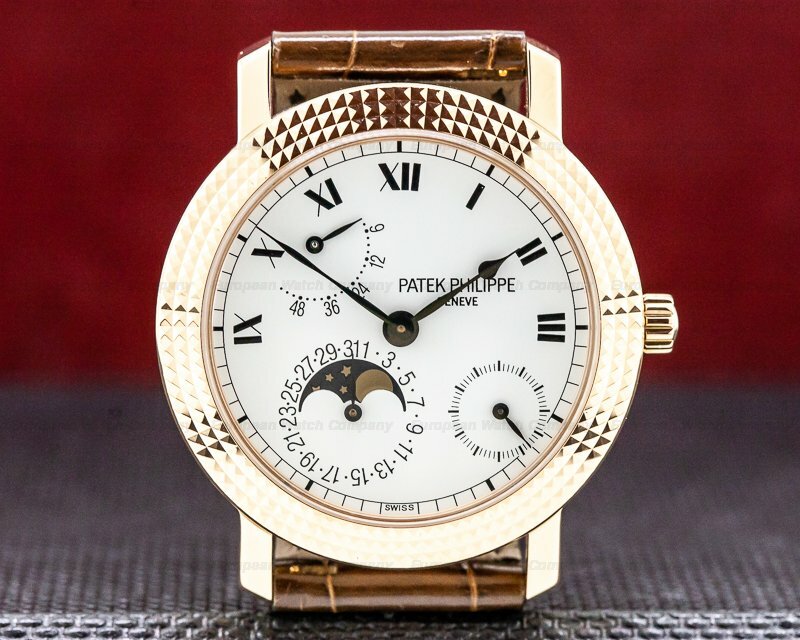 Patek introduced the moon phase display in 1927. 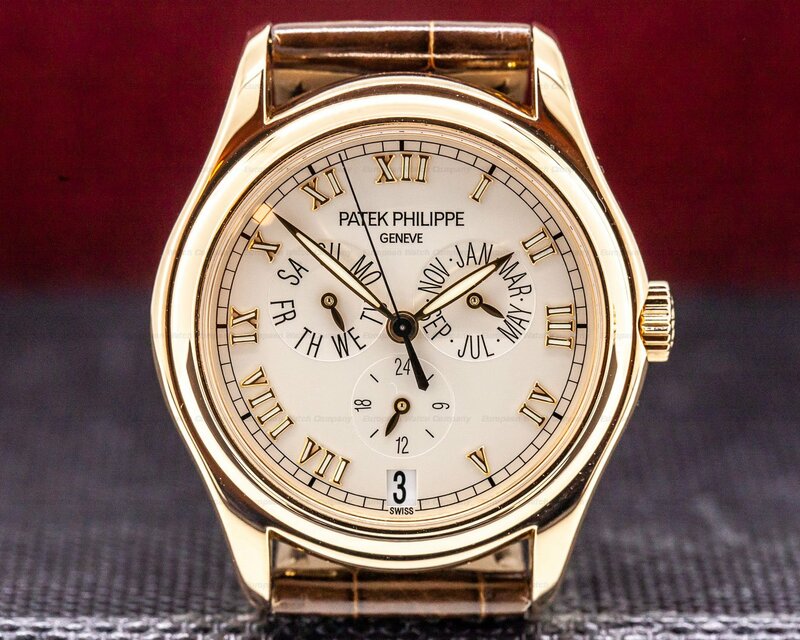 This annual calendar watch was debuted in the late 1990's as the 5035, which this model replaced.